Tesla CEO Elon Musk announced the most awaited Dual Motor (All-wheel drive) Tesla Model 3 variant along with the Performance Version Model 3 now available for reservation holders to order online. Elon Musk further posted the details of the dual motor and performance version Model 3 vehicle’s drivetrain setup and technology as well in a Q & A session on Twitter. Let’s explore the details of each version with the available information at this point of time. As we discussed in a previous article that the Model 3 chassis is same for both Rear-Wheel Drive (RWD) and All-Wheel Drive (AWD) variants, therefore Tesla is able to offer the AWD version so quickly in the middle of the ‘production hell’. 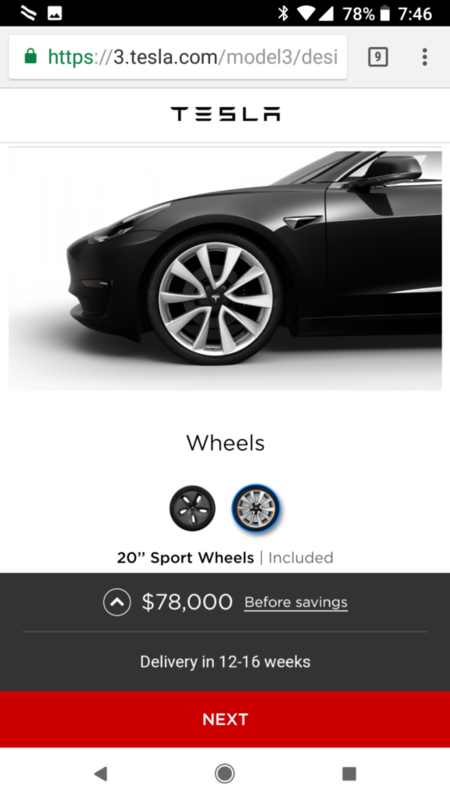 The Dual Motor (AWD) Model 3 variant costs an additional $5,000 as reservation holders are now starting to see the option available in Tesla Design Studio online. 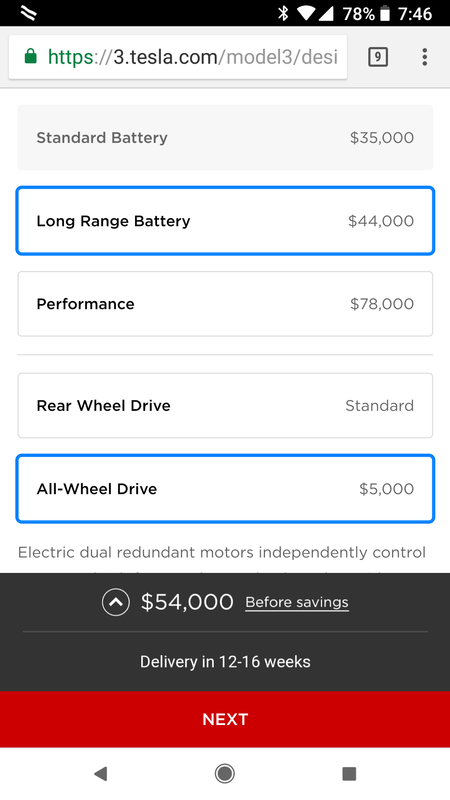 The dual motor Model 3 version is only available with the Long Range Battery ($9,000) and the Premium Upgrades Package ($5,000) which takes the total price of a dual motor Model 3 to $54,000 at least—excluding Enhanced Autopilot (as we can see in the following screenshot by u/teslamodel3fan from Tesla subreddit). As Tesla recently teased a performance version Tesla Model 3 in their latest promo named ‘Tesla 2018’ along with other mysteries, it’s now clear that they have unveiled at least one mystery from the bunch. 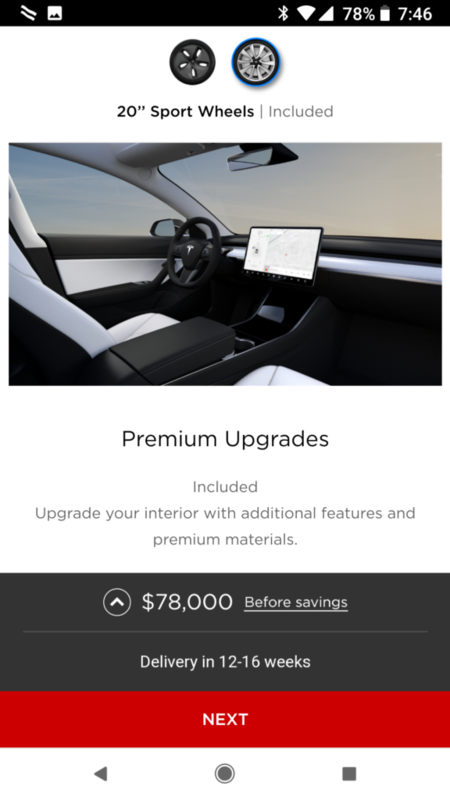 Tesla Model 3 Performance variant is the flat out $78,000 option in the online Tesla Design Studio that includes the beautiful white interior, 20″ sport wheels and a carbon fiber spoiler (see screenshots below by u/teslamodel3fan). White seats and interior is also one of the most desired option by Tesla Model 3 reservation holders but currently it’s only available with the Performance version of the Model 3. 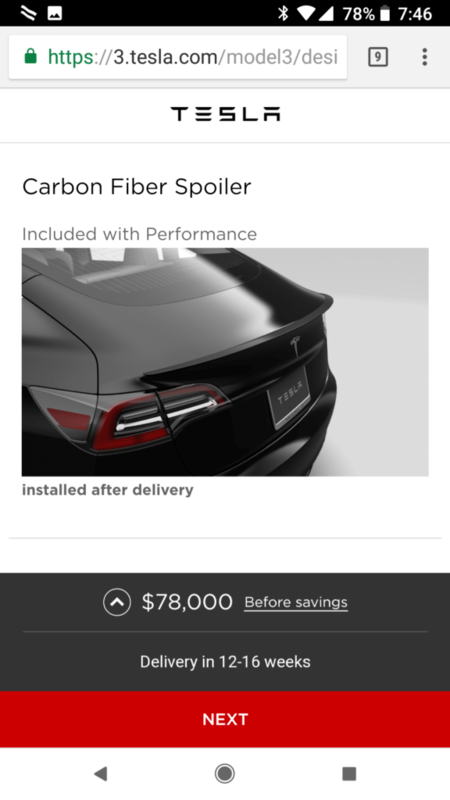 All of the three custom options are included in the $78,000 price tag of the performance version excluding Enhanced Autopilot. The performance version of the Model 3 would be limited to passionate motor sport enthusiasts but is still competitively priced as it goes from 0-60 mph in just 3.5 seconds—as we know Tesla estimates are quite moderate, real world results will be better than this when the car starts hitting the streets.